Opening Sentences: Dear Reader: We have to talk. I have failed you. I set out to write a book about the Globe Theatre and its great storyteller, William Shakespeare. … I wanted to tell you the story in my own words. But Will Shakespeare’s words are there, too, popping up all over the place. Synopsis: If you’ve ever said something vanished into thin air, or been told that more of the treat you want would be “too much of a good thing,” or if you’ve ever felt you’ve been sent on a “wild-goose chase,” then you have quoted Shakespeare, likely without realizing it. 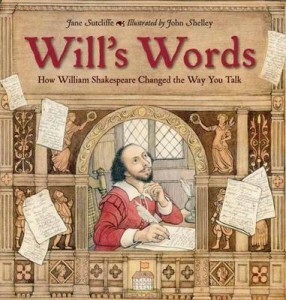 In Will’s Words, Jane Sutcliffe tells the story of Shakespeare and his Globe Theatre in a way that uses and explains many of Shakespeare’s contributions to the English language. Each double-page spread of this book is richly illustrated in detail (but in a fun way) showing a crowded street in London, or people at the Globe watching one of Shakespeare’s plays. Brief text, using at least one of the words or phrases Shakespeare introduced, appears in a box on the page on the left, telling part of the story, and equally brief text appears in a box on the right-hand page, defining the word or phrase and telling where to find it in Shakespeare’s plays. I learned a lot from reading this book, and I had great fun examining all the illustrations. Although it’s technically a picture book, it’s definitely not the kind you read as a story to a small child. This is a book for older kids, particularly those who like words and theatre, to really delve into. It would be interesting to look through Shakespeare’s plays and find the various places where Sutcliffe has indicated these words and phrases appear. The Charlesbridge (publisher) website has more information – you can see examples of the illustrations, and download an activity guide with reader’s theatre. Availability: Readily available. Check with your local independent bookstore.